Whether you like Jeremy Corbyn or not, it's easy to see that the state operated broadcaster casting the main political opposition as agents of a foreign power is the kind of extreme propaganda you'd expect to see in a tyrannical state like Russia, rather than a liberal western European democracy. 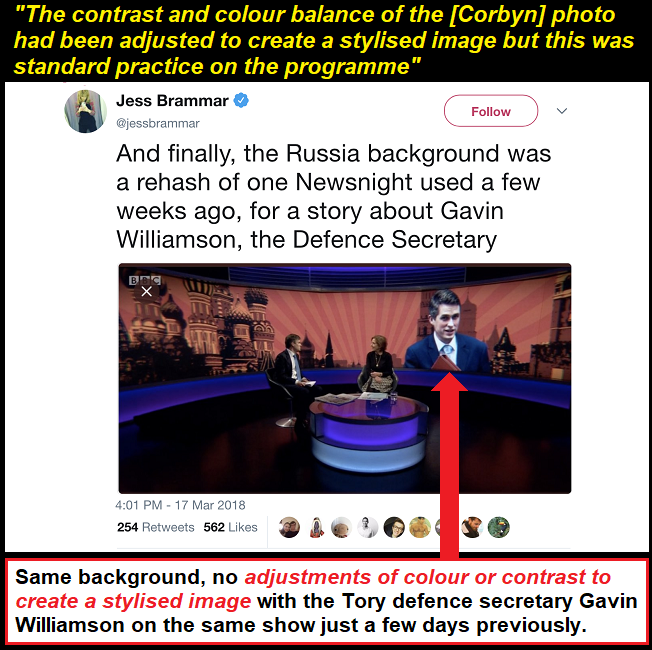 After a flood of complaints about their decision to red tint and alter a picture of Jeremy Corbyn and photoshop it onto a picture of the Kremlin, the BBC investigated itself and found that their decision to do that was totally "fair and impartial"! This latest ruling is a truly Orwellian piece of propaganda which focuses heavily on Corbyn's hat, and completely ignores the glaring contradiction between their initial responses to the scandal, and the findings of this report. The report tries to claim that it is supposedly "immediately apparent to viewers that the contrast and colour balance of the photo had been adjusted to create a stylised image but this was standard practice on the programme" but if we compare this excuse with their initial excuse we find a glaring contradiction. Their initial excuse was that they'd used the same Kremlin background for the Tory defence secretary Gavin Williamson, the whole thing falls to bits, because in Williamson's case they didn't red-tint or otherwise alter the image, and they positioned the picture of Williamson facing away from the Kremlin rather than merging him in to create a "stylised image". So their current excuse that it's "standard practice" to manipulate photos to create "stylised images" is totally contradicted by the picture that they Tweeted out as their previous excuse! To see the excuse morph from one thing to another like this is extraordinary, especially when one excuse clearly contradicts the other. 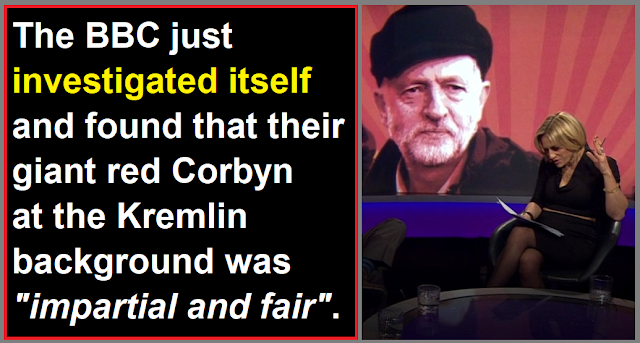 Even if you actually dislike Jeremy Corbyn, you'd have to be completely cracked to agree with the BBC's whitewash conclusion that there are supposedly "no grounds for regarding the contents of the item as less than impartial or fair to Mr Corbyn", especially given the blatantly contradictory excuses the BBC have pushed out to justify it. Since Theresa May came to power in 2016 the Tories have accepted £800,000+ in donations from Russian oligarchs and Putin cronies, and the Tories have repeatedly obstructed Jeremy Corbyn's efforts to clamp down on all the Russian dark money flowing into the City of London, yet it's not Theresa May portrayed as a Putin stooge on the BBC, it's Jeremy Corbyn ... And what's even worse is that they actually expect people to be gullible enough to swallow their Orwellian claims that using this photoshopped image as their background was completely "fair and impartial"! This isn't even the first time the BBC has been caught photoshopping images of Jeremy Corbyn to make him look bad. In the run up to the 2017 General Election they photoshopped him into a picture with Osama Bin Laden, and after the Trump election they photoshopped a Trump "Make America Great Again" baseball cap onto his head. Each time they create anti-Corbyn photoshop propaganda like this they generate more complaints and controversy, but they keep on doing it, and then keep on completely absolving themselves of blame like petulant children. 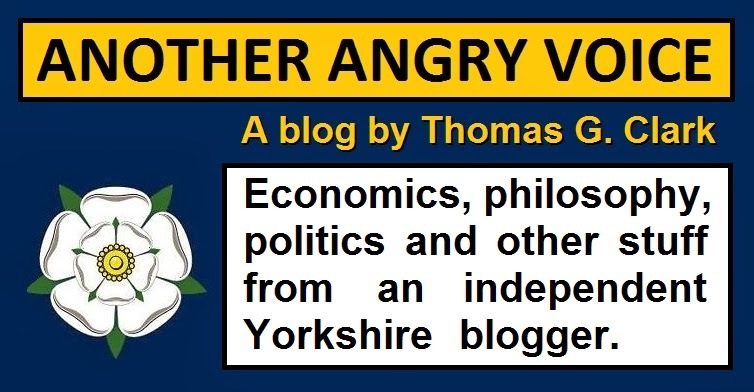 The more people complain about their transparent bias that we're all being made to subsidise through our TV licences, the more biased propaganda they feel inclined to put out, and the more Orwellian the excuses they come up with to defend the petulant contrarianism of their producers. If they'd even vaguely admitted that the background was poorly considered and politically biased, or that there was a significant discrepancy between their treatment of the Tory defence secretary and Jeremy Corbyn, then we could perhaps believe that they intend to learn from their mistakes and recommit themselves to political impartiality. But given their whitewash the conclusions are obvious. If a state funded and supposedly impartial broadcaster can look at such a transparently biased editorial decision and conclude that they did absolutely nothing wrong, that's an open declaration that they see no problem with the dissemination of blatant anti-Corbyn propaganda. 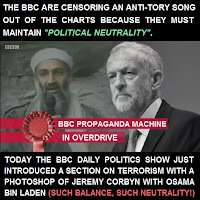 Furthermore it's clearly an open invitation to BBC politics producers to continue disseminating anti-Corbyn propaganda, safe in the knowledge that no matter how obviously biased it is, any BBC investigation will be another total whitewash. 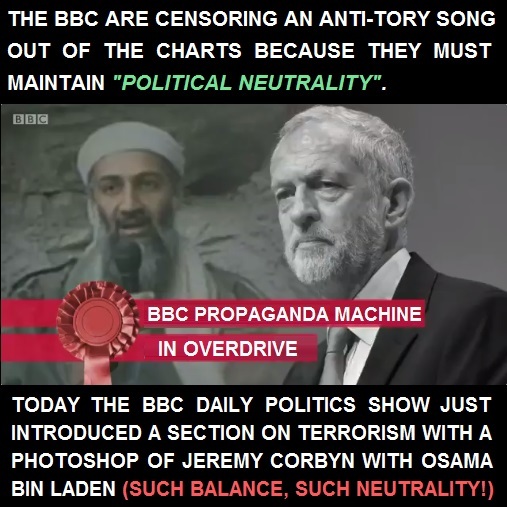 This whitewash is an open declaration that the BBC intends to continue disseminating anti-Corbyn propaganda, and they have absolutely no intention of admitting that this is what they've been doing, or that it is wrong.